Almost lost in the news of the Islamic State’s advance in northern Iraq since June, Fallujah in the west has been occupied by insurgents since January and faces regular bombardment by the Iraqi armed forces. Getting into Fallujah is far from easy. One must pass through dozens of Iraqi army checkpoints followed by dozens of checkpoints manned by the gunmen who now control the city. Unless one is doing humanitarian work one cannot enter or exit. And if the humanitarian aid workers don’t leave the city again at a pre-specified time, they are regarded with suspicion and may be detained. Additionally two months ago, the extremists who control the city gave an order that all journalists inside Fallujah must stop working. Any violations would be heavily punished, they said. So anyone who enters now – whether they are coming for humanitarian purposes or to visit a relative – is put under close surveillance. Masked gunmen on the streets observe visitors’ activities and communicate visitors’ movements through a radio network. They want to be sure that anyone coming into the city is not a government spy or a journalist. The main streets leading into Fallujah from the four major entrances to the city are booby trapped with explosive devices. These are arranged in a complicated and random fashion and nobody other than the gunmen who control the city knows where they all are. That means that nobody can enter Fallujah unless they are guided by one of the fighters. Once inside the city, you quickly see how exhausted everybody looks. Locals’ faces reflect myriad untold, sad stories. Most have lost at least one family member during this siege. There are also plenty of serious injuries on display. Many locals have now joined the armed groups controlling the city out of a desire for revenge. Many of the buildings are damaged or completely destroyed. Anyone who manages to get into Fallujah will see a city that looks as though it’s out of a picture taken just after World War II. There are dozens of similar stories. The Iraqi army has been attacking Fallujah since the beginning of the year. Every day the army shells the city two different ways – with ground artillery from their camps near the city. One of the major camps is the nearby Mazra camp. The people of Fallujah say that this method seems to be fairly ineffective and doesn’t cause a lot of damage. They are far more concerned about the second method the Iraqi army is using: air bombardment. Military helicopters bomb the city too – some of these helicopters are old ones, dating back to Saddam Hussein’s army, and some are new Russian-made machines, received recently. The helicopters often use barrel bombs, locals say. When these land and don’t explode, they try to disarm them. One thing the lieutenant is right about is that the Sunni Muslim extremist group known as the Islamic State, or IS, is in control of Fallujah now. The group forced all the other Sunni Muslim anti-government groups inside the city to hand over their weapons. In fact, a lot of the members of these factions chose to leave Fallujah rather than remain there at the IS group’s mercy. For example, last Saturday gunmen from IS led a tour of the city, parading blindfolded prisoners from the Mujahedeen Army. This militia, which controls terrain north of Fallujah, had declared war on the IS group. The number of IS fighters in Fallujah has also increased since anti-government forces first took over the city in January. 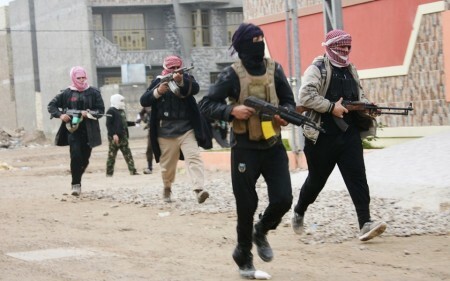 At first there were an estimated 600 members of the IS group in Fallujah. Now there are approximately 2,000 as others from inside the city have joined and as fighters have arrived from neighbouring Syria. PreviousIran Daily, August 30: New US Sanctions — A Sign That Nuclear Talks Are in Trouble?